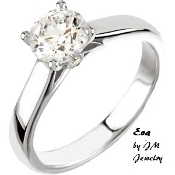 Our Products >> 14KW 1CT Solitare Engagement Ring "EVA"
14KW 1CT Solitare Engagement Ring "EVA"
"EVA" is an elegant Classic Solitare Engagment ring with two accent diamonds. This ring contains (1) Genuine Round Brilliant Cut center diamond 1ct - SI in clarity and G-H-I in color. The two (2) accent diamonds are 1.7mm=.04ctw.